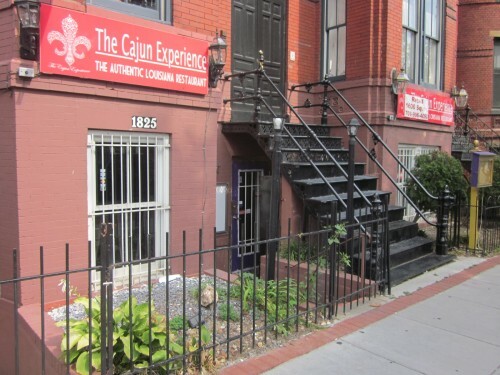 Located mid block between Swann and T Streets, NW., 2 doors south of Lauriol Plaza on 18th Street—substantial day and night foot traffic and good customer base with surrounding residential and business buildings—-an active retail strip with other restaurants and small shops—-4 blocks east from Dupont Circle and 3 blocks south of Adams Morgan——previously the Cajun Experience Restaurant— had an established customer base, eat in and carry out/delivery. Interior space of 1550 +/- sf— has full commercial grade kitchen, fully vented to roof, with 2 freezers,refrigerator, ovens, fryers, woks and grille, Vulcan stove,—- all gas fired, dishwasher and disposal——- new custom hand crafted wood bar and serving area with sinks, kegs, refrigeration,chiller and ice machine and small office area———, 2 front entrances, one main and one for carry out —-2 large bay windows on 18th Street sidewalk——- interior total seating of 45 with wood floors and original 120 year old exposed brick walls, pre-wired sound system and multiple TV stations———–rear double french doors lead to the back patio 600 sf. +/- with staging area and 25 seats. Recent interior build out and HVAC system——– all kitchen and restaurant equipment is functional and ready to go— finishings, furniture and equipment are available at best offered price. An ABC License is available for this property. MUST have successful existing restaurant management OR ownership experience and a viable product to be considered for tenancy. We require GOOD CREDIT SCORES and personal guarantees from all owners and documentation of financial strength SUFFICIENT to start and maintain the business—- NO EXCEPTIONS. Base rent is reduced for the first six months to $6950, after which base rent for the balance of the first lease year becomes $8300 or best above—– this INCLUDES base year real estate taxes—–tenant maintains premises and pays utilities and some small annual CAM charges.